RACES and CERT members should exemplify preparedness. Without it, the other phases of Emergency Management: response, recovery and mitigation, are empty words. How prepared are you? 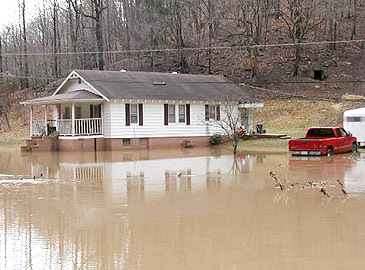 Have discussed your Family Disaster Plan at home? Do you have a first aid kit, flares or reflectors, water and an ABC dry chemical extinguisher in the vehicle you drove today? If you don't have these items in your “Go Kit” now, you have your homework assignment. We will give you lots of ideas. A survey of coastal communities indicated that barely a third of families plan for hurricanes or flooding. Only a fifth has a disaster supplies kit or evacuation plan. The VA Dept. of Emergency Management (VDEM) states that most hurricane- related deaths occur from inland flooding far from coastal areas. HAZMAT releases and transportation accidents can happen anywhere and may require evacuations and opening of shelters. What if your community was a target of terrorism? How many RACES volunteers could you mobilize on a weekday within an hour? How many of those are likely to be within an affected target area? If you don't think that your community is at risk for disasters, you are mistaken. Have you worked through likely scenarios with your local Emergency Management and developed a sequence if events and recommended actions for the types of disasters which are most likely to occur in your community? 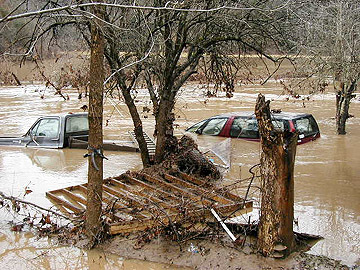 Consider these examples: Natural disasters - every Virginia community is at risk for tornadoes, severe thunder storms, winter storms and flooding. Technological disasters - Every community has the potential for HAZMAT releases and transportation accidents. Resource shortages - every summer drought, thunderstorm or winter storm brings the potential for loss of AC power and water and food shortages. Since September 11, 2001, all Americans should understand that we live in a dangerous world. Have you practiced EDITH? It stands for Exit Drill in the Home. When your smoke alarm goes off, crawl low to avoid smoke, exit the door, meet outside. Go to a neighbor's house or use a portable phone to call 911. Designate a pre-arranged shelter with a neighbor within walking distance, where kids know they will be safe, and can wait until you get home. Elderly relatives need someone to check on them daily and whom they can call for help if you aren't there. If your neighborhood is told to evacuate so that your nearby neighborhood refuse is not an option, your family will be more at ease if they know somewhere else safe and comfortable to go, instead of a public shelter. When local phone service is out, long distance “may” still work. So designate an out-of-area friend who agrees to accept collect calls from family so that everyone knows who to call to let others know where they are, if they need help or are safe. Ensure that family members know where and how to shut off the electricity, gas and water at the main sources, should they need to evacuate. Are your main utility shut-offs in the home plainly marked? Is there an adjustable wrench in plain sight near your gas meter? If your family ever needs to evacuate turn off all utilities to reduce risk of fire, water damage and contamination. “Your Family Disaster Supplies Kit “is a VDEM pamphlet developed by FEMA in cooperation with the American Red Cross. It lists essential food, water, shelter, first aid, and safety items which you should have already assembled in a sturdy, water-resistant, easily transported container, which is accessible at home or which can easily be taken with you to a public shelter. Each family member should have their own backpack to carry their own flashlight, extra batteries, a change of clothing, socks and underwear, sturdy shoes, personal medications, sanitary supplies and comfort items. Public service events are no substitute for a full-scale emergency response exercise. Most public service events occur within a radius of a few miles and can be handled on simplex more efficiently than using a repeater. Tying up an amateur radio repeater all day for public service inconveniences other uses and is usually unnecessary. Repeaters are appropriate when wide area coverage is necessary, and as backup into areas with poor simplex coverage, but in most cases a repeater shouldn't be used as the primary working frequency. If everyone develops an adequate simplex capability with suitable equipment and practices basic skills, loss of repeater coverage isn't a big deal. Effective EmCom operators must be flexible. So everyone should know the local simplex frequencies to use, have these pre-programmed into their rigs and exercise the local operating plan regularly. It's naïve to presume that repeaters are always going to be there to make up for a poor station on your part. How would you alert and communicate with your team if the phone, Internet and AC power were off for three days, the battery backup on the repeater goes dead after the first 24 hours or the “machine” on which you depend on takes a lightning hit? Use smoke signals? “Early in the game” we must teach new amateur operators where the “reverse” button is on their transceivers, what it is for, and how to turn the automatic repeater offset “on” and “off.” It's easy to get sloppy in radio etiquette because “machines” are plentiful and convenient. So DO use the repeater to make initial contact with a station, that's what it's for. But if you need to carry on a conversation of more than a minute, which doesn't require everyone in the county to monitor, quickly check the repeater input, and if you can copy the other party, move your conversation off to an APPROPRIATE simplex frequency to continue. This is good operating practice and common courtesy. But don't just move to any unused frequency. Amateur radio operators need to understand where the voice simplex sub-bands are. Respecting band plans comes under the heading of “good operating practice.” During summer “tropo” openings which are fairly common on 2 meters, low power FM transmissions where they don't belong, trash the weak signal sub-band along the entire East coast. Such interference isn't malicious, but is caused by people not knowing any better. Asking that someone “move” without suggesting an appropriate frequency only moves the problem and doesn't “fix it.” Educating offenders nicely does the most good in the long run. The three most common 2-meter simplex frequencies used nationwide are 145.52, 146.55, and 146.58. “52” is the national simplex calling frequency, whereas “55 and “58” are secondary calling frequencies used contesting and mobile-to-mobile or mobile-to-base use in some parts of the country. Standard channelization is important to reduce adjacent channel interference and to encourage efficient spectrum management in crowded areas. No amateur frequencies “belong” to anyone, but it is good operating practice to have informal agreements so that ARES, RACES, Skywarn and other groups don't “step on” each other. Encourage operators to pre-program their rigs to a standardize list and use mutually agreed frequencies for club and public service events, so they will already be used to their assigned ones during emergencies. UHF is less susceptible to intermodulation distortion from mixing with other radio services. It is virtually essential to get reliable inter-building coverage in high-rise urban areas where VHF simply doesn't work very well. In Virginia the “standard” 25 kHz UHF simplex channels are used for higher power base-to-mobile operations, whereas the 12.5 kHz “splinter” channels between then are used for low-power incident-area “talk-around” from portable units limited to 5w effective isotropic radiated power (EIRP). RACES communications stress good operating practices throughout. The most important aspects are monitoring channel use to avoid interrupting contacts in progress and the use of minimum RF output power to avoid desense to other nearby operators and interference to others whom you may not be able to hear. Use of dual-band mobiles as portable cross-band repeater links is useful in certain instances, but is not a panacea. If you use cross-band repeat, use low power, with CTCSS access control and appropriate UHF or 220 linking frequencies. A hand-held portable unit is inadequate as a primary rig for emergency communications. If you are close to a repeater and have a clear path, or are within a mile or so of other stations with whom you need to speak on simplex they'll suffice. But, out on the fringes of repeater coverage, mobile, challenged by building obstructions and terrain, everyone struggles to copy your lousy signal and uses up their batteries getting “fills” to pass your traffic. When it gets “down and dirty” don't stake your life on an HT, get a “real” radio. A portable unit is still needed for “walk and talk” solo, foot assignments, and as a spare or loaner. Just don't depend upon one as your only equipment if you are serious about EmCom. If your operators are apathetic, unprepared, don't use correct radio procedure, have a noisy signal into their local repeater, and don't know how to pass traffic or call up a net, they will be of little benefit during a real emergency. Use local nets to test, train and motivate. Lead by example. Demonstrate and encourage use of correct radio operating procedures. Practice handling traffic. Encourage questions and discussion of equipment, antennas, homebrew projects, emergency power and emergency planning to maintain interest. Rotate net control duties weekly so that everybody gets a turn and learns how. Recognize mobile, portable and emergency power stations and out of town visitors. Doing so keeps nets fresh and interesting and encourages RACES participation. Realistic training should presume that repeaters will either be inoperative due to storm damage, or will be operating on battery backup, which must be conserved for as long as possible. In emergencies we need RACES to operate the way we train. If you train for the worse case scenario, then you will be ready. If the repeater still works, but is on battery, don't run it down needlessly, lest it not be there for someone's emergency when they need it. If a net usually meets on a repeater, but the repeater if off air for any reason, some people won't have gotten the word, so use the repeater's output frequency on simplex, because that's where people will be listening. That beats the heck out of guessing where else the net may meet, and should be common sense. New operators usually want to get a “handy talkie” for their first rig, because their small size and portability are attractive. Instead, PLEASE encourage those old enough to drive a car to buy a mobile rig instead. They can always buy an HT later. A mobile with 25 watts of RF output is usually enough. If you get a 50-watt rig and run it at 25 watts the finals and your batteries will last longer. Using brute power is poor operating practice and is seldom necessary. You'll get more “bang for the buck” and enable your batteries to last longer by improving your antenna system and finding place high in the clear from which to operate. For RACES use you need a reliable, rugged, simple to use rig. It should be capable of operation from an external battery, have a low power option, such as 5 watts for maximum battery conservation, and a higher power, such as 25 watts for reliable simplex. It should be frequency agile, field programmable, with ten or more memories, have CTCSS encode and be packet capable. A dual-band radio is highly recommended in urban areas, because UHF and 220 get in, out of and around reinforced buildings better than VHF, and are less subject to intermoduation distortion. Every RACES member should develop at least an “appliance user” familiarity with packet. If you have a General class license, then consider a rig also having HF capability. Gets experience checking into nets at home, handling traffic and developing skill in portable and mobile operations. The short, flexible antennas which come with most portable are very poor radiators, typically negative 5dB. The best money an HT user can spend is for a study half-wave single or dual-band antenna which provides unity gain without a ground plane. 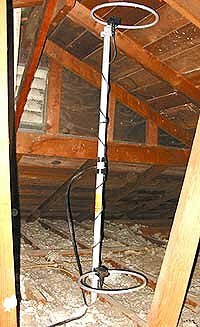 A telescoping half-wave Larson or AEA Hotrod or flexible J-pole made from 300-Ohm twin lead are good choices for your “Go Kit.” For fixed station assignments, soldered copper pipe J-pole antennas are both cheap and effective. Every HT user also needs an adapter enabling connection to a more efficient mobile or base antenna. Half-wave single-band or dual-band mobile antennas are needed for non-metal boats, truck caps, motorcycles, bicycles and wheel chairs. Lakeview, Larsen, Antenna Specialists and Antenex are all potential sources. A loop of 550# cord securely tied or taped to the whip enables any of these antennas to be hoisted into a tree for a higher radio horizon. Adding a “tiger tail” or ¼ wave counterpoise wire to the connector shield of your HT antenna improves performance and enables you to direct the main lobe of your signal to where you need it most. We'd prefer that you have a 3dB gain antenna and a means to elevate 15 feet or more, with a suitable ground plane. Be ingenious and flexible, but safety first! If you antenna comes into contact with overhead power lines you may be KILLED! Any large metal object can be used as an effective ground plane for a magnetic mount mobile antenna. Lakeview makes an inexpensive mast clamp and radial kit for most mobile antennas which works quite well. A simple folding TV tripod and three 5-foot sections of metal mast from Radio Shack, using cable ties, duct tape or hose clamps to hold the antenna, make a good expedient field setup. Higher gain than 3dB isn't necessarily better, because it is physically larger and sacrifices radiation pattern for gain. A 3 dB antenna doubles effective radiated power and has useable side lobes which get your signal out from around high-rise buildings, over mountainous terrain and obstructions. Any portable rig used for RACES should have THREE power sources: its OEM battery pack, AA battery case in case you cannot recharge your NiCd, NiMh or Lithium Ion battery, and an auxiliary power cord to enable connection to an external battery or power supply. Your gel cell battery should power the HT at full power for a 12-hour operational period. About 4ah is the minimum recommended, 7ah is better. If all you have is an HT and you cannot afford a mobile, consider a “brick amp.” You want an amplifier such as the Mirage B23 or BD35 which provides 10w output with as little as 1 watt of drive and is capable of 25 watts out with 2-3 watts of drive, when both the HT and the amp are just “loafing” along at about 2/3 of maximum rated output. The idea is to let the amp do the work without burning up the finals on your HT by running full power all of the time. The brick amp should be capable of occasional, intermittent 50w transmissions if really needed, though you generally avoid this because excessive RF power overheats the equipment and depletes your batteries faster. What “go kit” items are best for you is an individual decision. Search and rescue survival planners recommend three levels which build upon each other. This is the approach taken by Virginia RACES. Level I is what is your briefcase and pockets which you have with you all the time. Commuters using public transportation or who walk, rather than drive, may not have room for much more than their personal cell phone or pager, eyeglasses, driver's license and RACES ID, some cash for phones and vending, and maybe an HT, notebook and pencil. A zippered pouch which fits in your briefcase may enable additional items such a spare HT battery pack, personal medications, snacks, water bottle, pocket knife, small “backup” flashlight and a lighter or matches. It's better to have minimum essentials always with you, than to have a larger pack inaccessible during an emergency. You decide what works best for your circumstances. Every RACES member should prepare to at least Level II. It is recommended that your Level II equipment be stored in a backpack or shoulder bag in your vehicle, so that it is available quickly whether you are at home or away. What kit contents are best for you will depend upon where you live, your assignment and situational circumstances. Those living in urban areas will have different needs than those who are out in the country. Recommended minimum contents for everyone include your HT (if not carried at Level I) “gain” antenna such as a telescoping half wave or wind-up J-pole, extra battery pack or AA case, flashlight and extra batteries, utility pocket knife, personal first aid kit, RACES forms kit and operating references, earphone or speaker mic, local street map, notebook and pencil, stuff-able rain gear, hat, 1 meal and drinking water. In rural areas you may want a local topographic map, orienteering compass, insect repellant, sunscreen, fire starting materials, and an extra “warm” clothing layer. Selection of contents is up to you. These are starting recommendations. If you volunteer to provide mutual aid on a RACES Disaster Response Team, you are expected to prepare to Level III. Added to the previous two layers, Level III completes the “24-hour pack” for deployments when “it” hits the fan. Its emphasis is on personal protective equipment and “Ten Essentials” recommended by SAR and survival experts for deployment in an unknown environment. The recommended minimums are established from nationwide experience. All deployed RACES members should carry a reflective vest, leather work gloves, sturdy work boots with ankle support and a traction sole, rain suit, and either 4AA or 2D flashlight with extra batteries. For CERT and damage assessment missions, boots and vest must be ANZI-rated and your gear should also include hardhat, safety glasses, N-95 mask, and medical exam gloves. “Ten Essentials” recommended by Search and Rescue and survival experts include a first aid kit, map, compass, utility knife, food for two meals, fire starting materials, signaling materials, emergency shelter, extra clothing and water. The article “Your 24-hour Pack” provides rationale and descriptions of recommended items. It is recommended that you inspect and update the contents of all three levels twice yearly in the spring and fall. Necessary radio equipment to support your RACES assignment should be packed in separate “grab and go” containers. Rigid protective containers are recommended for the radios themselves. Tools and accessories are transported easily in a contractor's tool bag. You must evaluate what is really mission-essential, versus what merely adds to the weight you must carry. You don't want excessive radio clutter precluding your having essential safety, comfort and life support items needed to sustain you through an event. It does no good to have a great station with batteries for 96 hours if you are can't operate because you are cold, wet, hungry, sick and tired. It is essential for every RACES operator to have auxiliary power for a minimum of 24 hours or you simply cannot do your job. Radio Officers, field team and emergency stations with standing assignments should plan for at least 2 days of activity on a 24-hour basis until relief resources arrive. This is reality when disaster strikes. Most new RACES members have no idea how much battery power they need. My favorite answer when somebody asks is, “How large a battery can you carry? As much battery power as you can get from your car to the operating position is `almost' enough.” Estimating equipment loads to determine the size of your battery system is relatively simple if you accept some basic assumptions. A typical operating duty cycle for voice nets is about 20 percent or one minute of transmit time to 4 minutes of receive. A packet BBS is approaches 50 %. Battery amp-hour ratings are based on a 20-hour discharge rate. This doesn't mean that a 50-amp-hour battery will power a 10A device at full-key-down for five hours. What it does mean is that the battery will power a 2.5A device for 20 hours. Capacity is reduced non-linearly as operating loads and duty cycle increase. The only way to be really sure is to sum the current requirements multiplied by the operating duty cycle for each accessory and piece of equipment. But reality is that most people are too lazy to go do the calculation. If you want a “quick & dirty” rule which will keep you out of trouble “most of the time,” use the Amp-Hour per Watt Rule. Ensure one amp-hour of battery capacity for each watt of transmitter output, for each rig, for each 12-hour operational period. Experience in search & rescue, wildfires and floods has validated this simple rule in practice. It represents the MINIMUM which every RACES operator should have available all of the time. Translating the “rule” to specific tasks, auxiliary power recommendations have been validated for typical RACES operator assignments. Virginia RACES recommends these levels as deployment minimums. Understanding the minimum recommendations with respect to specific tasks is vital for viability of the RACES missions, because maintaining communication of your field team or operators on solo assignments with your base impacts operator safety. Handheld radios should have THREE sources of power: the original battery pack, a AA battery case and a means to connect it to an external DC source such as a regulated power supply, auto cigarette lighter or gel cell battery. Virginia RACES recommends mobile radios as first rigs for new operators of driving age. To operate a mobile radio from a portable field location, even at low power requires a battery which stresses some people's limits of portability. If you limit most transmissions to 5-10w and use higher RF output only when absolutely necessary, a 17ah gel cell weighs about 12 lbs. and fits into a briefcase or small backpack and is adequate to power a compact typical solid-state FM mobile radio for a 12-hour operational period. If you need to run a laptop and TNC in addition to the radio for digital ops, OR if you must maintain 25w transmitter output for reliable simplex, then you need at minimum a 26-pound, Battery Council International Group U1 battery. This is the minimum battery recommended for a 25w mobile radio and can also power portable HF-SSB equipment with output power reduced to 25w, with a signal loss of only one S-unit compared to running 100w output on the same antenna. These are 30-34ah, depending upon construction and can be fitted into a military M2A1 .50 caliber ammunition can for easy transport of multiples. Carrying two U1s per field team is recommended. The recommended batteries for stationary RACES operations are the BCI Group 27 or 30 deep cycle, widely used in telecommunications, marine, RV and agricultural applications. These are widely available and common almost everywhere. You must bring a hand truck or dolly to lug these any farther than a short distance from your vehicle to an operating position. A pair is recommended for Radio Officers and Emergency Stations for home backup and is adequate for a temporary field command post. For indoor use get sealed AGM construction, so that you need not be concerned about acid spillage or out-gassing of hydrogen during charging. They are the batteries of choice to power your HF radio or 160-watt VHF/UHF brick amp for Field Day and contests. Group 27 or 30 batteries are the largest that a physically fit adult can safely lift alone onto a hand truck and transport from the Battery Mart to your car and over to the Red Cross chapter house or EOC. A bank of four group 27s or 30s provide amply backup power for a permanent fixed station or as repeater backup. If you try to move larger industrial batteries such as L-16s used in golf carts without a helper, you WILL hurt yourself. Large industrial batteries are for permanent installations in fixed facilities only, never for field deployments. Flooded batteries lose half of their capacity at 32 degrees F. They must be stored upright, in well ventilated areas, and require careful attention to correct charging, periodic system testing and maintenance. Battery conservation isn't the whole answer, but is simple common sense and good operating practice. Conserve your batteries by using the minimum transmit power for reliable communications, with the most efficient practical antenna and shortest run of low loss feed line. If you operate from your mobile, running the engine 10 minutes of every hour will avoid draining the battery so much that the vehicle won't start, but remember that when the AC mains are down and there is no electricity to run the pumps, that it is foolish to waste scarce gasoline to run your auto alternator to keep your battery charged when you may need that gas to evacuate! If you have a truck or RV you might equip it with a dual battery system and isolator diodes. These formulas are based on a fully discharged battery. SLA battery manufacturers warn against attempting to achieve a full charge in less than 10 hours. This is because the battery will gas, swelling the case, and possibly blowing the safety vents, causing loss of electrolyte! A charger for 12V gel or AGM batteries should not exceed 14V. Wet lead-acid, “flooded” batteries are inexpensive, plentiful and familiar. They can be a great buy if you accept their limitations and are willing to perform regular inspection and maintenance. A slow recharge at a controlled rate is recommended to get the greatest number of charge-recharges cycles from the battery. The Battery Council International recommends a charging of 5 percent or 1/20th of battery capacity, expressed as “C over 20”. “Float” charging is used for equipment which isn't used frequently, to prevent self-discharge when the batteries are left idle. Float chargers are generally ½% to 1 percent of battery capacity, but run all the time. Continuous float charging of a sealed lead-acid AGM or gel cell isn't recommended, because it will dry out the electrolyte and case gas bubbles which reduce contact of the gelled electrolyte with the plates, causing premature failure. For general RACES use you want a low-amperage, automatic charger. This compares the battery voltage against a pre-determined reset point in the microprocessor which controls the charger. The Schumacher Model SE-1-12S is a 1.5A automatic charger which can safely recharge small gel cells over 2ah if time and temperature are monitored, or can be connected continuously to batteries of U1 size or larger and maintain up to a Group 30. It sells for about $30 and has overload, reverse polarity and temperature protection and is available at www.batterychargers.com Ordinary auto battery are designed to deliver up to 16V to enable mixing of electrolyte of flooded batteries at the end of the charge cycle. They will ruin a sealed gel sell in short order, unless a diode or two are placed in line with the “hot” lead to limit maximum voltage to 14 volts. The Schumacher SE-600 is a 6A dual-mode charger with both “flooded” and Gel-AGM settings. How many nets have you listened to where people have checked in using batteries and called it “emergency power?” Batteries are “auxiliary” power because their capacity is limited if you don't have solar or other means for recharging. 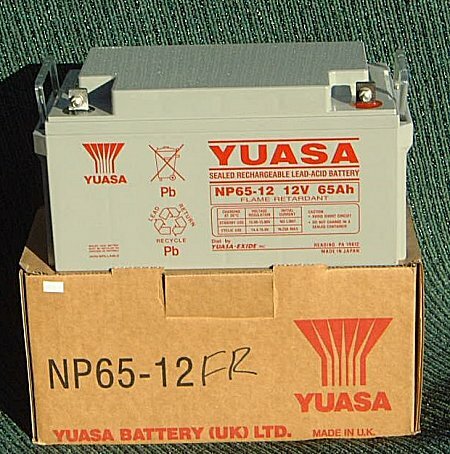 If you check into a net on batteries and you have 8 hours or greater actual operating time available, then state the amount of available hours. If you don't know how long your batteries will last, you should use them for en exercise, Field Day or contest operation to find out! If the AC power went down right now, how long could you operate your station? Everybody likes to use a generator for Field Day, but they aren't the best EmCom solution. They are noisy, distracting, generate gobs of carbon monoxide, require a reliable source of clean fuel and poses a host of safety and operational considerations. If you decide to buy or use a generator, you must educate yourself in its safe and proper use. The Virginia Department of Cooperative Extension and the Consumer Product Safety Commission provide consumer safety information which is a must-read for anyone contemplating a generator. Carbon Monoxide Hazard. Generators use internal combustion engines which produce carbon monoxide. To ensure adequate ventilation of exhaust and fuel vapors, never run a generator indoors, in attached garages or near HVAC air intakes. Set up under an open canopy, shed or carport. Electric Shock Hazard. Don't connect or plug a portable generator into a building electrical service. Plug only individual devices into the generator using UL-rated cords of adequate wire gage for loads. Ensure adequate grounding of the generator and equipment. Don't set up generators or feed lines on wet ground. Fire Hazard. Fuel vapors are heavier than air and can travel along the ground where they may be ignited by any arc, spark or open flame. Store fuel outdoors in a ventilated shed and use only approved containers. Typical gasoline generators produce about 600w at 120 volts AC per engine horsepower. A 100 watt HF transceiver requires about 1200 AC watts at 120 volts. Generator capacity must be sized to not only the running wattages of the equipment, but also the starting loads. For low-loads such as furnace fans and lighting multiply running wattages by 2. For heavy loads such as pumps, winches or compressors multiply the running wattages by 7. A 5KW generator adequate for maintaining essential appliance in a single-family house or a mobile command post requires 12 to 15 gallons of fuel every 24 hours. Section F-3201.2 of the Virginia Uniform Fire Code prohibits storage of more than 5 gallons of gasoline in residential areas. National Electrical Code requires backup generators connected to a building electrical service be equipped with a double-pole, double-throw transfer switch. This disconnects the building service from the AC mains when the generator is connected, preventing injury to utility workers servicing the lines. It also protects building equipment from back feed when the AC mains come back on. Under the Virginia Uniform Electrical Code installation of a transfer switch requires an electrical permit and must be done by a licensed electrician. Photovoltaics are a viable option for RACES operators who want to maintain battery banks. A 30 or 40 watt panel can maintain up to four Group 27 batteries. A minimal solar system of about 1.5 percent of battery capacity is self-regulating and adequate to maintain batteries against self-discharge. Such a system is generally much less expensive than a general of similar capacity, and you don't have the associated fuel safety, supply and storage problems. 24 HOURS battery power for everyone. One amp hour, per watt of transmitter output, for each 12-hour operational period. Have LOCAL NETS meet on simplex to train, test and motivate. Everybody needs a 3dB portable antenna and a way to get it 15 feet or more in the air. EVERYBODY needs to get on the air and practice. Elmer new operators to teach them to set up safely use correct operating procedures. RACES emergency communications, done “right” seem “transparent,” to emergency managers. Trained operators have technical knowledge to work around problems, operate from the same sheet of music and don't waste their time or anybody else's by sloppy work. Just because we are “amateurs” doesn't mean that we don't maintain the highest standards of performance and integrity. So go out there, do it right, do it safely and set a good example for your fellow operators. by KD7EFQ on December 13, 2003 Mail this to a friend! VERY nice article!! Well Done! This should quiet some of those nay-sayers who post that Amateur Radio is "Just A Hobby" and nothing more, and that we don't have a place in emergencies. I am currently following our state ARRL reps advice by getting a portable HF station together, and this info is very helpful. Thanks. 73.
by K4FAU on December 13, 2003 Mail this to a friend! Prctice message traffic formats. And use the trafic formats of those that you are supporting. The Coast Guard has a format that we have been using for years now, yet you would be surprised that people that tell us that they are here to support us and the Fla State Police spend half their time trying to put the info in the right format so we can send it (thus wasting their time and ours) -- so get with those you may support and go one-on-one with them. 1. we have no idea who you are (you could be a physical theat to us (terrorist), a crazy guy, or someone that can genuinely help - we don't know and normally we will not take the risj so we will send you home and thus piss you off and then you go home and write letters to your congressman that you were there to help and we turned you away thus cuasing us additonal paperwork to defend our actions. 2. You do not know how we operate and we do not know what you can do to help us -- and during a crisis this is a bad time to learn. Also, we strongly recommend that you put your "survival" or "emergency" comms gear in one centralized loction, run it up once a month for testing, and store it all in one Rubbermaid type container - in one place. You cannot imagine how many times guys have game out to assist us only to ask us if we have this or that or a battery, flashlight, road guard vest, extension cord, or charger, because they can't find theirs. A HT with a dead battery or a packet missing a cable is of no use. by W7REX on December 13, 2003 Mail this to a friend! I have been follwing your advice from the first time I found your "Ed's Red" recipe on rec.guns years ago! Since I found your articles on the VA RACES pages, I have found you to be a interesting, multi-faceted individual. Thanks! Your article is informative and will serve well for a jumping-off platform for further EMCOMM study. I hope I can get others in my county to read your articles and think of RACES beyond SKYWARN. by K0BG on December 13, 2003 Mail this to a friend! Prepared? I see you have your control head mounted atop the dash with velcro. This is a disaster waiting to happen. If you're ever in an accident, the velcro will let go and your control head will become a flying brick! by AMATEUR2003 on December 13, 2003 Mail this to a friend! I have been desperately trying to find a way to help with emergency communications and have participated and observed in several drills and nets but have been discouraged with the poor performance I've seen implemented along with the reluctance to give or accept criticism and point out serious flaws with their procedures. Nothing but lots of back patting and self praise as everyone packs up and goes home for the rest of the day. For over a year of observing my local ARES and Skywarn chapters it appears the priority is more on politics than professionalism. It's more of who knows who or who's been doing it longer, which doesn't mean doing it correctly as I've observed. In my opinion, most of the local EC's got where they are through the buddy system more than with qualifications. The last drill was the real disaster in my opinion. Wrong information continuously being given, I listened with my own ears as the area's assistant top EC answered for every station that was being called, there were over three counties participating but he'd answer for every station in every county, wrong ambulance numbers called out for which area hospital they were going to, wrong number of victims on the way, problem after problem but all you would hear for the next month was how great they did and boy we can't wait for the next one. When the local ARES/EC honcho here started sending spam emails totally non-emergency related, that's when I called it quits. by SSBDX on December 13, 2003 Mail this to a friend! Screw the radios! Last summer I bought 2 big 125ah marine batteries, a sinewave inverter, and butane stove so I don't have to sit in a house for 3 days with no lights, tv, stove, or fans in 90 degree weather again. by K3PZ on December 13, 2003 Mail this to a friend! This is one of the most beneficial and well written articles that I have seen on Eham to date. Thank you for taking the time to help your fellow hams like me who have been struggling with putting together an emergency backup station for the hurricane season here in south Florida. by KG6JUF on December 13, 2003 Mail this to a friend! from a new ham, thanks, great article,this is what I needed. by NN7B on December 13, 2003 Mail this to a friend! There is no such thing as being too prepared! :) Excellent article Ed. In my opinion, hams are either helping and part of the solution or little more than part of the problem if they're not prepared. by KE4SKY on December 13, 2003 Mail this to a friend! I agree on not using Velcro for mounting a rig or any accessory weighing more than a few onces, but have found that if you use LARGE patches of military or marine rated Velcro, which encompasss the entire contact area of the device, not just a few pieces, that it can be quite secure. My FT900 control head shown weighs about 1/2 pound, and is VERY difficult to remove. It didn't move off its mount mount when my vehicle was rear-ended by a 2002 Ford Crown Victoria (taxicab) which struck my stopped 2000 Jeep Cherokee (at a stoplight) with sufficient force to total the Crown Vic. I am still driving the Jeep. by W4CNG on December 13, 2003 Mail this to a friend! Great article ED. Your VA RACES web site has lots of informative and useful (just do it) information for Emergency Preparedness. Best of luck in this Holiday Season, looking forward to the next installment. by KZ9G on December 14, 2003 Mail this to a friend! This is just great, Ed. Mega kudos. Keep 'em coming! by AI4CB on December 14, 2003 Mail this to a friend! Very helpful article. Thanks. As a fairly new Ham I have been intending to get involved in emergency service and this article helps me start planning. In doing some research, I find that apparently there are TWO RACES/ARES groups that claim state-wide jurisdiction in Virginia. There is the ARRL Section ARES/RACES organization, and Virginia RACES, Inc., a private group. Apparently there was a big spat several years ago, where both groups butted heads over who had authority during an winter-storm emergency that was declared by the Virginia Department of Emergency Management. As I understand it, both ARES/RACES groups claimed to be the prevailing authority for Amateur radio efforts, and each challenged the authority of the other, which seemed to have caused a lot of confusion for the State office. As far as I can tell, there was no resolution to this spat. Some time after that incident, which occurred early in 2001, the Virginia Department of Emergency Management issued an "Open Letter to the Amatuer Radio Community ( http://165.176.249.147/library/openletter2.htm )which, when you parse it out, says essentially nothing definitive except that Virginia Department of Emergency Management is in charge of emergencies in Virginia, and encourages everyone to work together to resolve the mess. Otherwise as far as I can tell at this point, there has been no further resolution. The ARRL Virginia Section website seems to totally ignore Virginia RACES, Inc. The Virginia RACES, Inc. however contains information that seems to be implying that this spat is still going on 3 years later. As a resident of Virginia, and new Ham who is is concerned about emergency communications, I am somewhat worried and even a little embarrasses that the Amateur community would get into a p***ing contest when they're needed most. Confusions seems to me to potentially be far more of a threat to emergency communications efficacy than whether we have enough backup batteries. Can someone please advise me whether the Virginia RACES/ARES situation has been resolved or if not, has there at least been a polite agreement of some sort that the two RACES/ARES organizations will tolerate each other and work together? Personally, what I care about is that the most effective and responsive organization take the lead and I genuinely dont' care which one it is. by KB1DIG on December 14, 2003 Mail this to a friend! Sound advice and written for today's world!! Thank you very much for this Ed. You are truly an inspiration to all of us! As you were to Kim (KB1GTR) and myself 2 years ago, when we setup this information on a basic everyday Go-Kit Ideas Webpage. Please don't procrastinate.. Gather up all your HT stuff and build your first Go-Kit today! It's much easier than you think! by WA4MJF on December 14, 2003 Mail this to a friend! the right groups for your area. Officer and the County ECs County Radio Officers. It is a seamless transition from one to the other. by KG6AMW on December 14, 2003 Mail this to a friend! Good article. Through out the article are various references to frequencies and general types of radio equipment. How about a very condensed paragraph from someone on what (VHF/UHF)radios are recommended for responding to emergencies and what frequencies should be covered. This is from someone who has lived in the HF world from the get go and hasn't been anywhere else. Yes I know there are several training programs available via the ARRL and local government. by VE7SDX on December 14, 2003 Mail this to a friend! by N8SEX on December 14, 2003 Mail this to a friend! "Prepared? I see you have your control head mounted atop the dash with velcro. This is a disaster waiting to happen. If you're ever in an accident, the velcro will let go and your control head will become a flying brick!" by N0TONE on December 14, 2003 Mail this to a friend! This is the most comprehensive article on the topic I have ever read. Many, many congratulations for a job well done. In our area, our primary emergency is flooding, which happenes every spring with snowmelt and spring storms. There are several rivers which flood, forcing poeple out of their homes. It's a low income area, and nobody is prepared for the water problems. Because of the low lying nature of the area, VHF FM is not functional, and we must use HF. For many years, our local RACES and ARES organizations were heavily focused on VHF FM. After futile attempts to keep a large enough stockpile of "portable repeaters" available, they resorted to using mobile HF stations for the direct comms from the affected areas. It became obvious that HF was essential. As a result, the ARES and RACES members whose licenses allowed it, were encourage to participate in HF emcomm nets. We've been using HF for about ten years now and have discovered that our best emcomm ops possess the emcomm training in net protocol, and are also DX and contest operators. Even when on VHF FM, those operators, who are expierienced, virtually daily, in digging a weak signal out of noise, require the fewest repeats of a message, and are also the most capable of condensing a message down to its minimal components. My message then is, that all this planning is great, but please don't overlook HF. You can often do much more with HF, and if your operators are active HF ops, then you are never short of operators who understand radio and communications so thoroughly that they know how to "tweak" an antenna installation for a "bit more" and know how to properly get a message through in difficult times. by W9YP on December 14, 2003 Mail this to a friend! Thanks for such a good article on emergency prepardness. I read this article with interest not only because I'm an amateur, but because I am responsible for developing an emergency prepardeness initiative for the Truckee Meadows Water Authority, the water authority reponsible for devlivering fresh water to about 400,000 residents of Reno, Sparks, and Washoe county in northern Nevada. This article helped me to realize that emergency prepardness, and practicing for a disaster response is bigger than I anticipated. This article will help me have more ammunition to convince local government leaders of the importance of the amateur community in a disater response scenario. by KC8VWM on December 14, 2003 Mail this to a friend! This is a good reminder that there is more to civil preparedness than simply having an HT strapped on your belt, and volunteering at service events. Amateurs involved in Ecomms should be properly prepared for the real thing. This means you should be ready for the possibility of the worst day of your life. Walmart won't be open to buy any batteries. Grocery stores will have no power, therefore they will be closed. You gas generator will be useless because gas stations will be closed. You will have no lights or electricity in your home. You will have no heat in your home. Expect that you will have no telephone service. It is interesting to note that in our modern times that there are people that actually freeze to death in their own homes, in a major thriving metropolis, simply because they don't know what to do?! Now I can understand if this happened to people after a plane crash in the Swiss Alps during a snow blizzard, but in their own homes in a city center?! Yes, like Ripley says , "Believe it or not." it's true. What is your position on the matter? A valuable collection of civil preparedness articles, lessons learned, recommendations, and past disaster experiences explained. Submitted by Ed Harris - KE4SKY Radio Emergency Communications Training Officer - State of Virginia. by W3ULS on December 14, 2003 Mail this to a friend! This article is somewhat misleading because it suggests that hams in the Commonwealth of Virginia are effectively organized. I do not believe this is true. From what I gathered from the recent report of the (Virginia) Governor's Task Force on Hurricane Isabel emergency response, there was precious little communication between local governments and Commonwealth emergency officials and mass confusion resulted. Apparently--if hams were involved--their efforts were insufficient to overcome the serious communications breakdowns. This suggests to me that in the Commonwealth Virginia, at least, hams may be part of the problem rather than part of the solution. My recommendation (for Commonwealth of Virginia only)is for Virginia radio amateurs to decide on an organization, and man it, so that hams trained in EmCom can be accessed by the Commonwealth's authorities whenever and wherever needed. This organizing effort must take a higher priority than what appears in the article--having the right equipment, test exercises, etc. A journey of a thousand miles begins with the first step. To do this, the silly, juvenile and ongoing RACES/ARES bickering must be eliminated. Until that's accomplished, Commonwealth of Virginia hams cannot responsibly talk about how to help out the local and Commonwealth authorities because our help is not available, nor can it be proffered, in a seamless, organized, effective manner. As a newcomer to the hobby (3 1/2 years) I have observed that many hams would rather argue over real or imagined slights of whatever origin than act like grown-ups. I'm reminded of the old man with Irish Alzheimer's--he forgets everything but the grudges. by K9KJM on December 15, 2003 Mail this to a friend! And the 5 KW generator does not really need to run the full 24 hours per day to keep a radio station/household in operation...... I have run mine in actual power outages only a few times per day to recharge the deep cycle battery that runs the radios and the well pump to provide water for the household. very easily......... If the generator is run only when really needed. Thanks again for a GREAT article!!! by WA2JJH on December 15, 2003 Mail this to a friend! I have seen these combo 19AMP/charger/tirepump/work ligh in one. They have jumper cables of course. A few cigratette plugs, and full metering. I bought one at a closeout for $29. They sell just about everywere for under $75. I have not used it in an emergint situation. Mine is THE COLEMAN POWERMATE. The emergency light and air compressor I could see as being handy. Does it live up to its near 20 AMP continouse, and enough peak amps to jump start a truck? I bought the FT100D ater 9/11. It was found out the multi band mobiles with 25 watt or greater output was what really came in handy. by KB9YZL on December 15, 2003 Mail this to a friend! VE7SDX brings up a good point. All “Velco” products are not the same! I use 3M “Duel Lock” extensively in our mobile installations, and have NEVER had a piece of equipment come adrift,…… including an event where one of our Vans ended up on it’s side! by K2GW on December 15, 2003 Mail this to a friend! Great advice as usual. Keep up the good work. WA2JJH - Does the Coleman Power mate measure up? by N0TONE on December 15, 2003 Mail this to a friend! "Does it live up to its near 20 AMP continouse, and enough peak amps to jump start a truck? I keep it charging all the time. I guess you never know. Would likr to think all those amps are their "
I submit that this sort of thinking is hazardous to your emergency communications preparedness. You should know the limits of your gear by measurement. The performance WA2JJH wonders about is easily measured. By not measuring it, he is only hoping, or worse yet, guessing, that he just might be prepared. If you do not test it, then it is guaranteed NOT to be up to snuff. by WA2JJH on December 16, 2003 Mail this to a friend! AM,-appreciate concern. I did test it in my shop. No, I do not have a truck handy to try a jump start(hi-hi). I did a few charge and discharge cycles. I used a 100 W 12 volt bulb as the load. I did get about 2 hours of light. It did live up to the AMP-HOURS spec. This is in a lab. Charged perfectly. Room temp. I do not trust rechargables in general. I keep 12V alkaline lantern batts as my main source. My question was more general. I have not used it under emergency conditions yet. For it's cheap price, was wondering if anybody has used this model over time in cold, hot,wet, and emergent situations. QC is very important. I thought if a few have used this model, did it hold up? Was it dropped, submurged, or did the compressor hold up. Is it not always prudent before you buy a rig for example to get as many reviews as possible? That is not a dangerouse or a fool hearty thing to do, no? This applies most importantly to emergency back up. Maybe I got a good one. Maybe others have found them better off as door stops! by KE4SKY on December 16, 2003 Mail this to a friend! In Virginia communiities where the local ARES organization is well organized, trained and has an existing working relationship with their served agencies, Virginia RACES, Inc., the corporation, encourages that relationship to continue. Virginia RACES, Inc. exists to support statewide mutual aid in areas where there isn't sufficient depth of resources to support communications in events which last more than one 12-hour operational period. During the response to hurricane Isabel in Virginia I was on paid duty status with my agency and not involved with amateur radio at all. I was busy enough in the EOC as public works logistics officer dealing with a million people without city water or AC power, 200 homes damaged or uninhabitable, and 2300 people evacuated from a flooded area and in shelters, hazmat releases, and trying to coordinate cleanup, damage assessment and reentry. During the time our EOC was activated, based on my experience in working with those amateurs as a local government official through two 12-hour shifts, our EOC amateur radio communications were handled competently by rotating groups of ARES, RACES and MARS operators who worked together cooperatively in Red Cross shelters and in the EOC. In Fairfax County, where I live, our emergency manager makes no distinction between various amateur radio organizations. He simply wants competent radio operators who follow instructions and are competent in their assignments. This requires adequate training, planning and exercises. Some operators belong only to one organization, but about 2/3 belong to both ARES and RACES and our County government encourages and supports dual membership in both groups because each organization provides different levels of training and experience which build upon and support each other. To respond to W3ULS, it's up to local emergency managers and served agencies to develop auxiliary communication plans in their Emergency Operations Plans and to decide whether or not they choose to use amateur radio to fill that need. Many local EOPs in Virginia make no mention of amateur radio at all. Ours in Fairfax County didn't until our EOP was completely revised and restructured after the September 11, 2001 Pentagon attack. FEMA local program grant funds were used to purchase amateur equipment including VHF, UHF, HF, for our EOC. In Northern Virginia ARES ECs in the cities and counties represented in the Metro Washington Council of Governments Emergency Mutual Aid Compact work with their local emergency managers and include amateur radio in their communication plans and exercises. Where the ARES structure is alive and working, there is no reason to change anything. Elsewhere downstate some emergency managers have executed agreements with VA RACES, Inc. because local amateurs were not sufficiently organized or trained to meet local communication needs. In a few cases local EMs wanted to continue working with the same points of contact they had prior to a change in ARRL Section Leadership. Personally, as a mid-level public official whose duties include emergency resource coordination, damage assessment and debris management, I'm interested in promoting effective EmCom, not amateur radio club or organization politics. In my contacts with emergency managers around the state I support amateur radio regardless of the organization to which hams belong. I also emphasize to them that it is essential to have an effective volunteer organization, training which includes health and safety considerations, as well as accountability of personnel and adequate supervision, to include performance reviews. Without these, using untrained, unorganized volunteers regardless of their dedication and good intentions poses a serious risk and liability problem for the served agency. If an amateur radio organization doesn't provide this leadership infrastructure, the local emergency manager or state EMA needs to take on that role. In Virginia VDEM dropped the ball by letting localities go their own way, without providing any specific guidance. I think this was the case because states are waiting for guidance from FEMA and DHS with regard to use of volunteers. In times of tight state and local budgets, funds to develop volunteer resources such as Community Emergency Response Teams or RACES, take a back seat to public safety radio system, first-responder protective equipment for WMD and EOC enhancements. Without FEMA program grants, and modernization to meet current interagency emergency management needs, RACES as a Federal program will cease to exist and ARES will be limited to local weather reports for NWS, and shelter comms for the Salvation Army or Red Cross. In my opinion the failure of local to state EOC communications during Isabel wasn't the fault of amateurs, but of state and local emergency management whose plans didn't adequately address how to best use amateur radio as a volunteer resource. I know that some emergency managers are actively reviewing their AARs to look to amateur radio as a low-cost fix to limited and specific communication problems, such as shelter comms and coordination of non-public safety resources having incompatible or disfunctional radio systems. While many amateurs dislike being "told what to do" those who expect to do EmCom must accept that the served agency is in charge and sets the policies, practices and procedures. With increased needs for auxiliary communications to support infrastructure protection and other needs associated with Homeland Security, if state Emergency Management Agencies don't soon set adequate standards in their local plans, it may come to pass within a few years that the Federal government could step in with national standards for state and local use of amateur radio for emergency communications. This could come under the guise of a rejuvenated RACES program, bring the obsolete Cold-War "duck& cover" regs into the post-911 era, to include CERT communications etc. If hams don't like the smell of that, they probably won't do EmCom because emergency management isn't going to to be able to use just anybody who walks in with an HT, amateur licence and a callsign hat anymore. I agree with you that it would be best if all groups would work together and play nice, but few individuals who still attempt to hack our web site, upload viruses and circulate hate and discontent within the amateur community do not support that idea. Virginia RACES, Inc. does have some MOUs with some local emergency managers and specific state agencies, such as the State Medical Examiner and the University of Virginia-MCV hospital system. but the organization doesn't compete with ARES to provide local government communications. It exists as a statewide resource for mutual aid when local resources are inadequate to provide operators for rotating shift coverage, etc. The corporation, Virginia RACES, Inc. was formed primarily to have a nonprofit entity to enable tax-exempt corporate contributions of tower space, training facilities, copying, audio-visual, web and support for the VDEN statewide digital network, free operator training for our 860 members and mutual aid anytime, anywhere, statewide, when requested by emergency management. Our training materials are free on the web for anyone to use. We welcome outside peer review and agency critique as part of our policy of encouraging continuous improvement. by N3QT on December 16, 2003 Mail this to a friend! by KE4DRN on December 17, 2003 Mail this to a friend! by KD5UJX on December 17, 2003 Mail this to a friend! There is a lot of great information here. I will put it to use the best I can. However, here in south Texas, I don't see much organization. RACES is dead. ARES is still breathing and with some help, it might live. I live in Refugio County. There are four, count em', four hams in the entire county. One, me, the EC is trying to get something going here. But, with such a large pool of ready volunteers I don't think that will be much of a problem. What can us little guys do? I want to help. by KE4SKY on December 17, 2003 Mail this to a friend! For KD5UJX, first check the FCC database to ensure that you have identified all of the licensed amateurs in your county. Then start identifying businesses which radio dispatch service trucks, taxicabs, etc. and contact your local emergency management or DPS field office to determine if there is a Local Emergency Planning Committee or LEPC in your area. LEPCs are normally formed with business and community based organizations to address hazmat response and environmental issues, but may be structured to address any concern to local emergency management. If amateur radio resources are scarce in your community, the local EOP can and should address emergency auxiliary communications using all available radio assets, public safety radio, commercial telecomm, business and LMR radio, GMRS, citizens band, amateur radio, smoke signals, carrier pigeon, etc. My advise is to identify others in your community who have ANY 2-way radio communication experience at all. And if they are interested in public volunteerism, help and encourage them to become licensed amateurs. In Washington, D.C. the city doesn't use hams, but CB and GMRS in its emergency plans. The Arlington County, VA EC, Alan Bosch, KO4ALA met with the Federal City REACT group and several of their personnel became licensed. A few of the amateur ECs also obtained GMRS equipment and became licensed to be able to interoperate with REACT on its UHF repeaters. If there is a local communication need to fill and there aren't enough amateurs to do the job, you need to either identify other amateurs in surrounding localities so that neighbors can help each other out, and/or identify other assets which can be used, and recruit those you can to get amateur licenses. We all need to learn to "think outside the box." Doing so is a force multiplier. by KE4SKY on December 18, 2003 Mail this to a friend! To KG6AMW - I can send you, or anyone else who wants to contact me off-list, examples of our state emergency nets SOP, example local and state RACES amateur frequency plans and a modified ICS Communication Plan template we use, if any would be helpful. The communication plan template provides primary, alternate and tertiary frequencies for operations, logistics, admin and digital nets which encompass FM repeaters, local VHF/UHF FM simplex, 2m and HF SSB for regional and statewide use, as well as digital modes. Standing statewide nets are listed and blanks are left open for local radio officers to fill in their local repeaters and simplex talk-around for specific geographic areas or assignments. by KC0LNU on December 31, 2003 Mail this to a friend! by WA1RNE on January 11, 2004 Mail this to a friend! As already pointed out, mounting a radio on the top of ANY vehicle's dash board is a potential safety hazard unless it's bolted down using a bracket. But more importantly, even if it is safely bolted down, leaving the head OR the entire radio exposed to direct sun light for extended periods can subject it to temperatures which are significantly higher than it's maximum ambient operating temperature. by N7CAV on June 3, 2004 Mail this to a friend! I've encountered several situations where six bags of gear won't fit inside the driver/passenger side of an already overloaded emergency vehicle when the task is to deploy with an official or other organized team. You will find in many situations that your vehicle will be left behind, as well as all your gear, and it's up to you to have what you need on your hip or your back. This article is very complete, but aimed more at redio officers and coordinators. Your typical ham will be deployed within the situation, under the direction of some established authority. That authority will yield good information from this article, but the new ham doesn't need to spend gobs of cash to match this level of readiness. Use common sense. For new hams- Get the HT first and the mobile second. There are plenty enough of us idiots with x-band mobile capability and portable ops. Focys on an external speaker-mic, dry-cell packs, better antenna and reliable external 12v SLA power and adapter for your HT. All that stuff will carry with you and give you full dismount operation. Don't let your self buy every little think for ECOM- You'll end up with dozens of rechargable and SLA batteries never used, as well as gear that just ends up collecting dust. If you graduate from the local club's political academy and find your self responsible for the safety of other hams, go back and re-read this article. by N2CTZ on June 27, 2004 Mail this to a friend! by XE1UFO on July 19, 2004 Mail this to a friend! By the way, this GREAT article should have been posted under the new Emergency/Public Service heading.